so, how shall we begin? We are currently 24 years after the fall of Xemnas, and all Organization XIII was dead. We are based out of Memory's Skyscraper, and the Castle that Never Was is uninhabited other than Lessers. 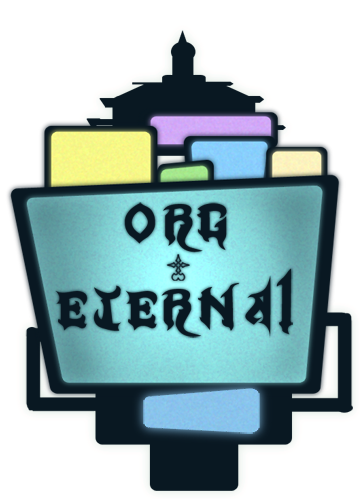 Org Eternal is run by Raxen and Xiron, with help from Jinx, the numbers I, II, and III. For the most part, everyone else is generally on equal terms in-character. And just make sure you know the rules and keep up on happenings located in our journal. And we can begin a short roleplay whenever you'd like. That should be all. i'll go through the rules on here in a second. i'm a paragraph style RPer, i don't like script too much, but i can do it. For the time being I will be taking over for Xiron's place in watching your trial until he is available again. As soon as you have read up on the "main room", the "training room" and the dorms, then we will begin. Raxen came down the stairs and headed into the nearly empty main room, making a straight line into the kitchen he claimed a cup of freshly brewed coffee for him self. Heading back towards the main room, sipping it half concentrated, he sat back and started to go over the work for the day in his head. a pale skinned boy, trotted up the stairs, keeping to himself, stopping only to look around and admire the odd structured building. he slid his hands into his jacket pockets, and push on the large doors. they gave way to let him pass through. Zadexy blinked, nervous, and called out a little "hello?" He didn't hesitate to step inside, and formed his large Claymore, keeping it beside him, in case his exploration got him into more trouble than he had bargained for. Raxen looked up towards the nobody entering, raising a brow at his intrusion he stood and headed towards him at the entrance. "Put that weapon away, and tell me why you're here" He said sternly, though that didnt keep him from sipping at his coffee mug. Dex heard the unfamilliar voice and let out a shriek. he snapped the massive claymore behind his back, letting it melt into his body. "uh... hi, yeah.. hi" he waved a few times and stopped himself abruptly. "i... was actually... looking for someone" he forced a lopsided smile, trying not to act too scared, more flustered. "i... ummm, was, supposed to be looking for the, leader of.. Abyssus? or, something like that? this, isn't the wrong place? is it?" he rubbed his forehead "oh not again... wrong place right?" " Yeah, wrong place there." He sips his coffee and looks him over watching the nervousness about him. "This is eternal, so if you dont have anything you need here you know the way out, yeah?" He lowered his mug and watched him patiently. "oh! okay!" he paused, thinking for a few moments and quickly flipped open his palm, reading the engraved words. "OH! i remember" he smiled and blushed akwardly "umm, yeah! i was going to go to a place called Abyssus, buuut i ended up going to Eternal," he thought for a moment and nodded. "if, it was okay" he smiled, finally getting his wits -or lack thereof- together. He raised his eyebrow in confusion at that statement. "Uh huh, of course you did..." He sighs and takes another sip of his coffee " I am the superior, yes......." taking a moment to scratch his head and consider how he was going to deal with this stranger he continued. "There some reason you came here?" Zadexy nodded and smiled "well, for one, i've come to see if you were looking for new recruits!" he pushed his black dreads back slightly and glanced to his feet, getting on one knee in a respectful kneel. "if, you so wish i would gladly become a part of your organization" he peered up to Raxen. "my name, is Zadexy, and if you accept me into your group, then you'll make a nobody, as happy as he has ever been able to be." "Uh right..just come on up kid, no need for that " He invites him into the main room couch and sits on an arm rest looking towards him. "Tell me about yourself.......what was your name?" Zadexy smiled to himself and nodded, he stood up and followed a few paces behind Raxen. "it's... a respect thing, sir" he said quietly and stayed standing facing his superior. "it's, how i was originally made... to obey the masters" he smiled to Raxen and watched him take a seat. my.. name is Zadexy, but.. you can call me Dex, or Dexxy, either is fine with me actually. i do believe i control plastic, and it's various branch out types, like vinyl" he tugged his robe and smiled "and etcetra. if you haven't noticed by now, i'm... not so good in unfamilliar settings... and i hate to admit it, but when i get scared, to extremes, i tend... to melt. quite literally actually, when i was first walking in i was having issues keeping my fingers in one place". he smiled and rubbed the back of his neck. "Well alright then Zadexy, you'll gain control of yourself in time. " He stands and starts toward the elevator "in the mean time, I'll show you a room"
"i shall sir... " he let his chin touch his chest in a bow and looked up. "is it a... good kind of room?" he asked, with a rather large smile on his face. "or, is it a room i should be worried about?" he shut himself up and simply followed behind Raxin, remembering he had broke training. "If you are worried about things being to plain for you, i suggest you worry. We only allow changes to your room when it comes out of your budget, but for the most part it's livable" He comes up to the metal doors of a elevator, they slide open and he continues inside, waiting for Zadexy to accompany him before pressing a floor button. The doors snap shut, and almost instantaneously fly open, revealing an new corridor ahead of them. Hallways branching off to hallways, each door seen is a room for a member, engraved with their status and rank, and decorated in the element of the respective resident. Raxen starts out passing them without a second glance. Zadexy followed him quietly and nodded, only to speak rather quietly "livable is all i'll really need"
he looked at the elevator doors, what was merely an instant to his superior, felt like eternity to Zadexy. "umm, sir... may i inquire your name?" he asked sheepishly, oncethe elevator doors opened up. "or, should i just call you superior?" he smiled "either way... you're name, probably defines your looks and personality to the proverbial 'T'." " I changed my name, but everyone knows me as Raxen" He looks back as he heads to a blank white door, opening it quickly to reveal a completely plain room. All white furnishings included a desk, bed, bathroom, and closet. Raxen turned to Zadexy. "Welcome to your room for the time being"
Zadexy peered past him to the room and once he was permitted, he stepped inside and looked back to Raxen. he smiled and made his way over to the bed, adjusting the sheets "perchaps... instead of a bed... do you think i..." he stopped himself and a faint blush spread across his cheeks "nevermind sir" he looked over to the closet and pulled open the doors, looking it through "this'll work perfectly." "if you need any changes down, I'm sure we can discuss them later on" He nodded to him and turned around "If you want to get situated, be my guest. I'll be waiting downstairs for you"
Zadexy smiled back to him and nodded "okay sir" he dipped into the closet and pulled the door closed, checking things out before he went anywhere. he poked his head out from the closet and snickered to himself. "maybe i should invite Raxen in here... see how well a nobody can really perform" he stretched out and looked around the room, 'hmm, i can make ends meet...' he thought and headed outside of his room, to meet Raxen downstairs. Raxen was sitting on the couch reclining when he looked towards the approaching nobody. Nodding to his presence and placing done his coffee cup he again stood and walks back to him. "Feeling good about this so far?" Zadexy stopped at the foot of the stairs, finishing up counting in his head. "there are an even number of stairs, that's unlucky... Sir" he coughed akwardly and shook his head. "Pardon... but yeah, i'm... feeling, pretty good about it" he smiled to his superior and let his head dip down. "what, is up next?" he asked rather curious. he nodded and smiled, "well, at least an elevator is easier on the joints.." he stood at the door, and slipped in next to Raxen. "i do admire your hair" he chuckled and folded his arms behind his back, trying to look as calm as Raxen. He looked over and nodded, "Thanks, at the very least it helps me stand out with the many other nobodies we have here" And again he pressed a button, prompting the near instant shift of floors as he walked out into the training room; a large gymnasium framed with stands for an audience. There were smaller areas purposefully for weight lifting and private training, then there was the arena, it's floor covered is it's own battle scars showing a rich history to sparring and combat. Off at the far end of the room there were stairs spiraling upwards towards a large overhead observatory connected to the wall. "Welcome to the TR, Zadexy, you'll be coming here every day your first week"